This chapter provides a review of design practices in network communication for Cognitive Radio Sensor Networks. The basics of networking and Medium Access Control functionalities with focus on data routing and spectrum usage are discussed. Technical differences manifest in various network layouts, hence the role of various specialized nodes, such as relay, aggregator, or gateway in Cognitive Radio Sensor Networks need analysis. Optimal routing techniques suitable for different topologies are also summarized. Data delivery protocols are categorized under priority-based, energy-efficient, ad hoc routing-based, attribute-based, and location-aware routing. Broadcast, unicast, and detection of silence periods are discussed for network operation with slotted or unslotted time. Efficient spectrum usage finds the most important application here involving use of dynamic, opportunistic, and fixed spectrum usage. 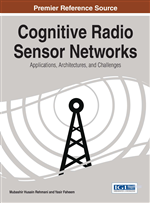 Finally, a thorough discussion on the open issues and challenges for Cognitive Radio Sensor Network communication and internetworking in Cognitive Radio Sensor Network-based deployments and methods to address them are provided. Increased usage of wireless communication and related emerging applications has triggered the use of dynamic spectrum usage methods. The key enabling technology for dynamic spectrum usage, i.e. Cognitive Radio (CR) allows opportunistic use of spectrum availability with reduction in spectrum space underutilization (Akan et al., 2009). The flexibility of operation offered by CR, provisions much of the currently adopted functionalities like use of optimal transmission parameters and minimum power usage in existing wireless systems with addition to adaptability for currently deployed strict spectrum allocation (Bicen & Akan, 2011), (Akyildiz et al.,2006). Dynamic spectrum utilization can also meet major spectrum related challenges posed by Wireless Sensor Network (WSN), particularly related to deployment of fixed wireless channel use in the 2.4GHz spectrum range. The spectrum use issue becomes more prominent when WSNs are used to monitor an area inside or in proximity to some building that uses the free Industrial, Scientific and Medical (ISM) band to operate Wi-Fi and other wireless devices in large number. Optimal spectrum usage is considered a serious concern for all major WSN standards like ZigBee, IEEE 8012.15.4, Dash7, WirelessHART and 6LoWPAN protocols since all of these operate under basic WSN node constraints pertaining to communication parameters and information processing capabilities (Akyildiz et al., 2002). A WSN node encompassing cognitive functionalities can potentially benefit from opportunistic use of channel for random, bursty, and high rate multimedia traffic while adapting to reduced power consumption. Wireless access to multiple channels within a spectrum range can also be accomplished in order to conform to different spectrum regulation policies. Multiple channel use facilitates an efficient and flexible communication oriented overlaid deployment of multiple concurrent WSNs (Akkaya & Younis, 2005). The merger of cognitive functionality with sensor devices gives rise to the new research domain of Cognitive Radio Sensor Network (CRSN) that aims to inherit dynamic spectrum usage while routing data from different environment monitoring sensor nodes. In order to develop intelligent CRSN applications, the Cognition enabled nodes need to comprise of a common application related communication protocol that exchanges messages in a dedicated format. The spectrum related information can be communicated through extra control packets for simplistic cases while for more complex scenarios, conventional WSN packet header and data payloads need to be intelligently utilized. In CRSN application, it is important to follow the resource constraints imposed by underlying WSN without any major alterations to the packet formats and other functionalities inherent to sensor network (Yu et al., 2011). Designing CRSN architecture requires understanding of concepts related to communication and networking with focus on network node layout, data routing, spectrum management, Medium Access Control (MAC) issues and cross layered Quality of Service (QoS) parameters.